Most proud homeowners, even those without the proverbial green thumb, appreciate a well-planned landscape in terms of their outdoor space. In areas characterized by arid, dry (sometimes humid) and a desert climate, it may seem a tad more challenging to have a lush landscape. The irony is, since you’re living in a desert area, you keep longing for lots of greenery the way urban folks do. Though the contemporary and sleek appearance of a well-planned yard may seem unattainable, using native plants can make it a lot easier to maintain a yard that is as interesting as your home interiors. In terms of choosing the right plants for your space, it is always beneficial to consult an expert. If you are living in an area where it is not practical to cultivate a traditional lawn, consider creating a drought-tolerant landscape. Xeriscaping is indeed a smart choice in areas where water conservation is paramount. The reduction of lawn grass areas is a common element in this form of landscaping. Another element of xeriscaping is the use of native plants which are well-adapted to the local climate, and thus require less water. Successfully create a lavish look by grouping the plants together. Besides, there is power in numbers! You can have your own beautiful garden by planting greenery in tidy groups or in rows. You can either saturate a certain area with plenty of the same plants, or perhaps introduce a bit of variety by integrating different types of native plants. By placing similar plants together and incorporating more than one selection, you can enjoy the eye-catching contrast. Big stones, pebbles and stone tile walkways are examples of rocky features that can beautifully complement your desert garden. Rocky features organically blend in with the desert surroundings, and provide a beautiful contrast to whatever greenery and desert blooms you will include in your desert oasis. If you are lucky enough to have them naturally existing in your area, consider using them to your advantage. If not, you can ask a reputable desert landscaping company to move hefty rocks and boulders, or provide all the rock materials you require. Although most desert landscaping techniques involve the use of gravel as the base, using greenery as an alternative base can add a sense of abundance and interest. Just be sure to get professional advice on how to contain them as some ornamental grass varieties tend to be invasive. Using greenery ensures your garden setting is striking and inviting. Low-water, desert-appropriate plants like succulents should be included in your list of greens. Yucca, agave and euphorbia are all examples of desert succulents. To add a splash of color to your desert landscape, plant bougainvillea, tropical hibiscus and yellow trumpet flowers. Planters are the best way to experiment with growing plants in a desert setting. This is highly recommended if you wish to add more than just native greenery to your garden oasis. If you are interested in cultivating plants that may not thrive so well in the dry desert climate during summer, consider putting them in a planter that you can easily move indoors when it gets too hot. Moreover, if you are unsure about cultivating plants that require high maintenance in your yard, you can try them out in planters or pots first. As you put the finishing touches on your desert landscape, planters can help you fill in gaps. For instance, try a tall planter if you need to add height to a certain section of your yard. Furthermore, you can create some level of privacy in your seating area with a row of planters that are filled with your choice of greenery. Rectangles, triangles, circles, and squares – geometry has a special place even in desert landscaping. All these shapes have multiple roles. They add a clean-lined modern aesthetic appeal. They let you define areas in your garden. They help you create individual garden vignettes. For example, you can have a straight-line path that leads to an outdoor sitting area, which is defined by a rectangular boxwood enclosure. Also, make the stepping stones that lead to the outdoor pool area circular. The possibilities are indeed endless! Today, a lot of homeowners want to have a bit of zen quality to their homes. This can easily be done in your personal desert oasis. Having a zen corner means you have a quiet place to just sit back and relax — a place of refuge where you get to forget all the worries of your day. So make sure that your desert landscape has a zen-like ambiance. Ever felt calmer and happy after hearing the soothing sounds coming from a tiny burbling fountain? Water features are considered paramount if you wish to add a touch of zen to your garden. These include fountains, ponds and pools. Moreover, you can incorporate benches, stones, statues and other pieces for the eyes to enjoy as you find more opportunities to relax in your desert oasis during relatively cooler weather. Think of winter in the UAE, and in other notoriously hot but beautiful places! Don’t forget to keep your gardening tools on hand in case you want to be hands-on in your garden maintenance, or if you do have the proverbial green thumb. Hand pruners are often used to chop off stems and branches. Pruning is an important gardening activity to keep your plants looking healthy and beautiful. There’s a lot of use for a hand rake which is actually your official soil manipulation tool. Use it to remove any weeds, smooth out the soil or turn the soil, using it as a mini-tiller. The spade is mainly used for digging and moving soil when you are planting. It has a rectangular, flat blade that allows you to dig with precision. You can also use a spade to make holes for planting shrubs and other plants, as well as to edge along a flower bed. This also does a great job when you are transplanting since you can use it to easily dig up plants. A shovel has a curved blade that works best for scooping and moving large quantities of sand, non-fibrous mulches or soil. A garden hose is used for sprinkling water all over your desert landscape. Though rubber is more expensive, it is far more durable than vinyl. Make sure to buy a hose that is long enough to reach all parts of your yard. In desert landscapes, however, professional landscapers usually make use of a combination of plant zoning and drip irrigation to maximize the water supply whilst reducing water consumption. As you can see, a desert landscape has a lot of elements, and it is not that hard to create a garden oasis that reflects your personal preferences while at the same time integrating practical concerns such as plant types and irrigation. Indeed, you can go all over the world to see breathtaking examples of lush greenery thriving in desert climes. Just take a look at the Huntington Desert Garden in San Marino, California, and the geographically and taxonomically diverse Madagascar. In Dubai, UAE, beautiful new self-contained communities like Cassia at The Fields in Mohammad Bin Rashid City are being established with the application of desert landscaping principles. 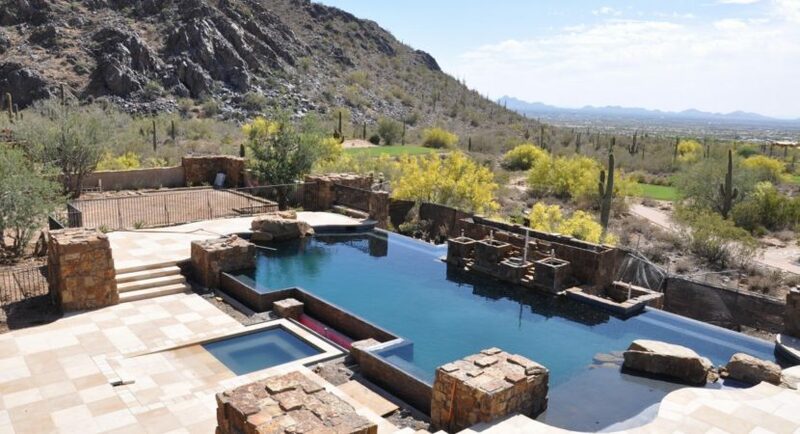 Gardens have a timeless appeal, more so for desert dwellers. It’s no wonder why earlier well-established communities like Emirates Hills and Jumeirah Islands in Dubai have remained picturesque through the years. The same can be said for communities in Palm Springs, California (USA), Casablanca in Morocco, and Sharm El Sheikh in Egypt.